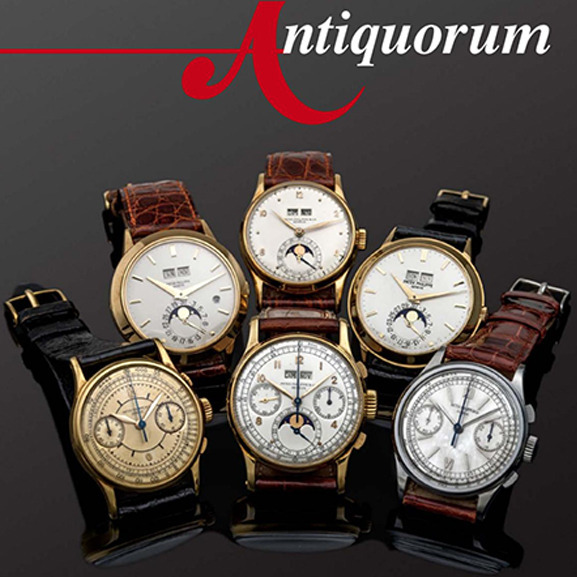 Antiquorum Auctioneers, the world’s premier auctioneers of modern and vintage timepieces, is going to have a wonderful auction this Autumn! On November 11th “Important Modern & Vintage Timepieces” is going to take place at the Grand Hotel Kempinski, Geneva. The first session of the auction (lots 1 – 228) starts at 09:30 am, the second session (lots 229 – 571) begins at 2:00 pm. Enjoy the auction highlights, if you'd like to find out more about the auction don't miss the auction catalogue! Click here to see the whole auction catalogue. Made for the Chinese market. 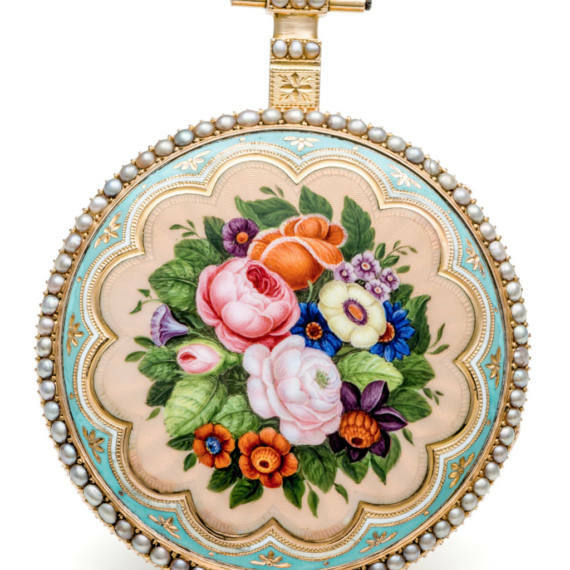 Extremely fine and very rare, large, musical, gold, painted enamel and pearl-set pocket watch with sur-plateau musical movement playing music on the hour or at will. Barrauds The first watchmaker of the family was Francis-Gabriel (1727-1795). His sons Paul- Philippe (1752-1820) and John (dates unknown) were working with their father by 1780. In 1796 he entered into a partnership with William Howells and George Jamison, to make chronometers based on Mudge's original design. Howells, who had been Mudge's junior worker, brought with him important technical knowledge. Alongside Barraud's production of chronometers, a range of other clocks and watches were produced, and a major business was the exportation of plain and musical clocks to China and India. This was continued by their successors and eventually led to the establishment of a branch in Calcutta. In 1838 the Chronometer maker John Richard Lund was taken into partnership, and with the death of the last horological Barraud, Hilton Paul, in 1880, the business reverted entirely to the Lund family. A fine and extremely rare brass movement. In good overall condition (in need of restauration). The movement of this watch, partially incomplete, No. 42 of Abraham Louis Breguet, is mentioned by him as being completed in August 1786. 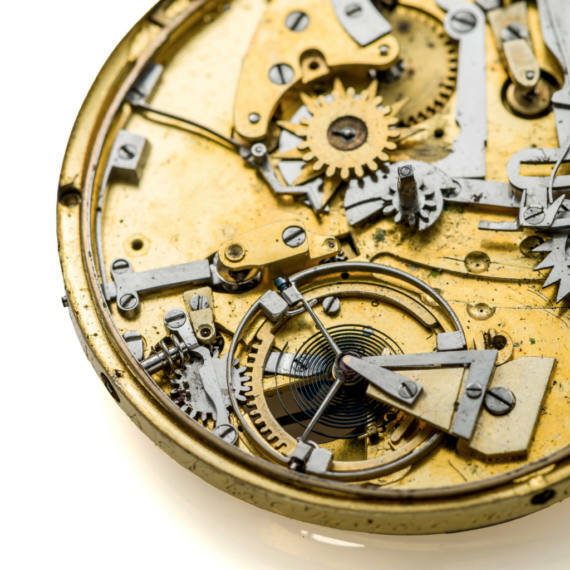 This watch is therefore one of the first self-winding movements, so called 'Perpetual of the history of watchmaking', that made the reputation of Breguet. These watches are very much sought after by collectors and are well documented by George Daniels, Emmanuel Breguet and Jean Claude Sabrier. The movement presented here has two barrels. In the evolution of the self-winding movement, this improvement that seems to be credited to Breguet, allowed him to obtain a better mechanical efficiency of his timepieces: the division of the strength of the oscillating mass on two barrels helped to reduce the wear of the mechanism which was a big issue in early timepieces. In the Breguet archives, 2 watches bearing No. 42 appear in their “livre d'etablissement” that contains part of the first 220 watches made by the firm. The information is mainly concerning those made between 1787 and 1792, a period marked by the French revolution that pushed Abraham Louis to exile himself to Switzerland. In this register it states '7-42, perpetual calendar with repeating with free escapement, April 30th 1787, case No. 2467'. This implies that this self-winding watch with quarter-repeating, bearing the number 42 was reconstructed based upon the watch No. 7. It was sold in 1787 probably bearing the case number 2 467. Not long after, one can find another number 42, repeating watch with virgule escapement sold to Monsieur Noisseuly 4th June 92, 1000 tt. In the first sales book of Breguet, one can find further interesting information about these pieces. One can notice under watch No. 42, a repeating watch on gongs and the mention of the 'watch No. 42. perpetual calendar repeating pocket watch with thermometer and silver dial', this watch was clearly made here, but we have no traces in our books; the watch seems to have been made in 1786 and a certificate of origin was made in June 1856. It was sold to Recordon London in 1795 for 700 F. In Breguet's production it is not the first time that a watch was found bearing the same case number such as this example for number 42. One of the 2 watches, there is the repeating watch sold to Recordon for the amount of 700F and the other, a self-winding quarter-repeating with silver dial, a 60-hour power reserve and thermometer which is the movement being offered here. The original case as well as the oscillating masses (probably made of gold) having been lost over the years are no longer present. 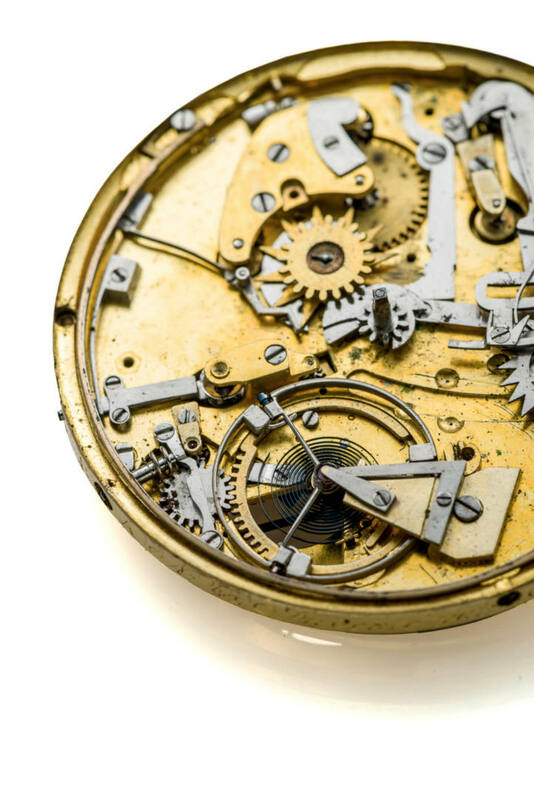 The dial on our movement is made of silver and bears on the reverse the number 651 and the letter R. This type of watch was then sold by Breguet for amounts varying between 2'000 and 4'000 francs at the HEIGHT of his pre-revolutionary production. 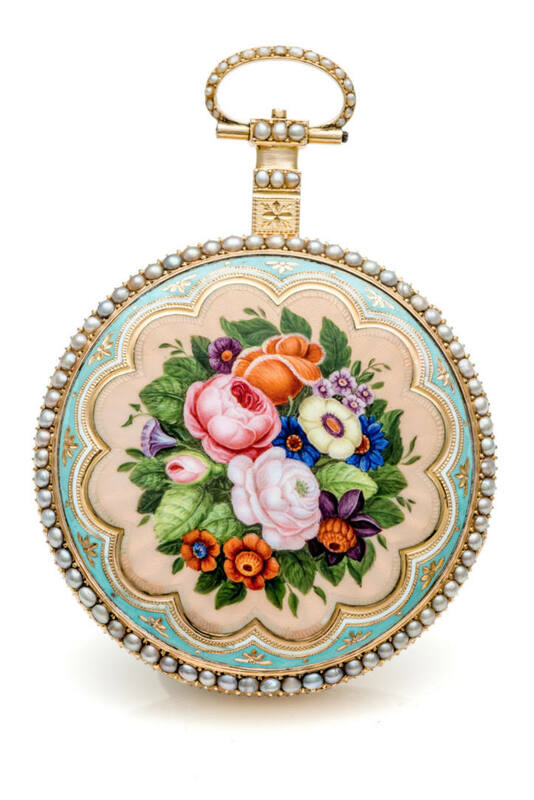 The dial is signed Breguet & Fils, meaning that the watch was probably transformed by Breguet circa 1810-1830, which was often the case at the time (when watches were often modernised by the firm, originally this watch would have been born with an enamel dial). A rare opportunity to acquire one of the first ever-made self-winding movements made by Abraham Louis Breguet. 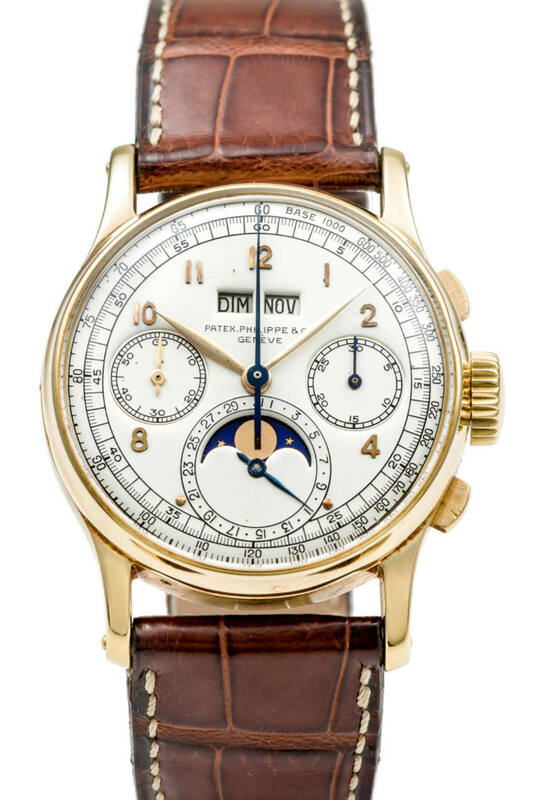 A very fine and rare, manual winding, perpetual calendar chronograph wristwatch with moon phases. Property of an important Italian family. Ref. 1518. Produced in 281 examples from 1941 to 1954, in yellow and pink gold, only four examples known to date in stainless steel. There are four distinct series of the 1518 although they did not advance chronologically as such but were available at the same time. – First series: with applied gold Arabic numerals from 1941 to 1954. 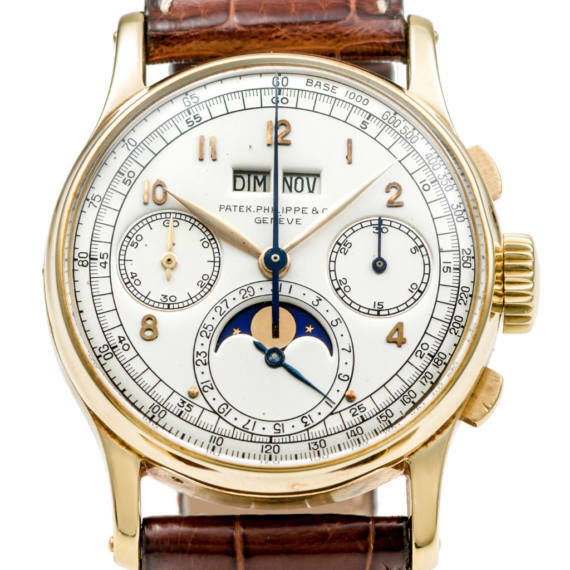 – Second series: presented at the Basel Fair in 1942 with enameled hour indexes, the 12 in applied gold Arabic numerals. – Third series: with applied gold indexes, the 12 in applied gold Arabic numerals. – Fourth series: with applied gold baton indexes. With only 281 examples having been made in total, finding a fresh to the market 1518 is becoming rarer and rarer. This example has stayed with the current family for over 25 years and is in amazing condition. Its case has maintained not only one, but two hallmarks (one to the side and one under the lug) and one can easily see from the THICKNESS and pin holes to the lugs that it has seen little polish over the years. Its beautiful original dial dating from 1943 has been kept in outstanding condition for its age. 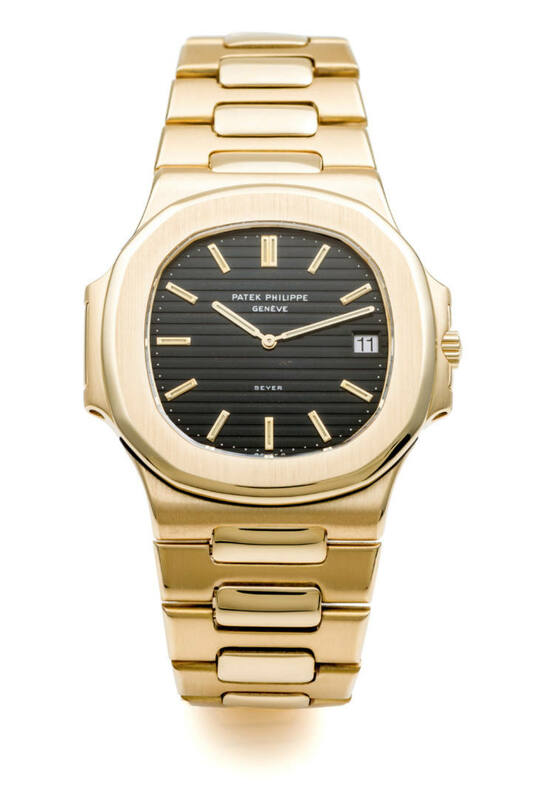 A fantastic new find for Patek Philippe collectors. An extremely fine, rare and important, astronomic, minute-repeating, platinum wristwatch with one-minute tourbillon regulator, retrograde perpetual calendar and moon phases in new old stock conditions. 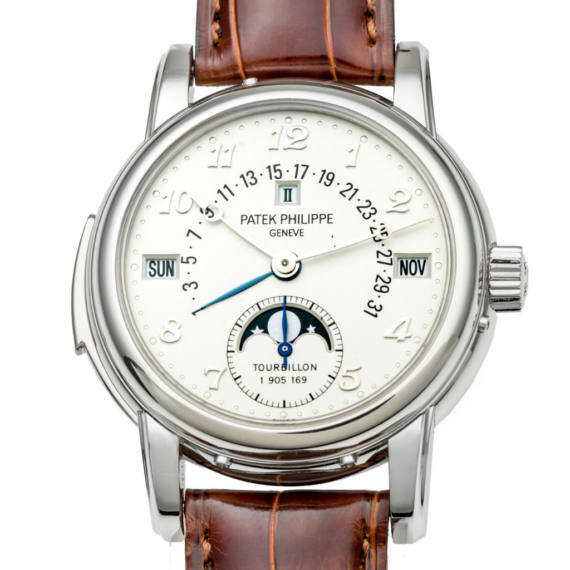 Introduced in 1993, the iconic PATEK PHILIPPE reference 5016 was the most complicated wristwatch in production until Patek debuted reference 5002, the Sky Moon Tourbillon, in 2001. 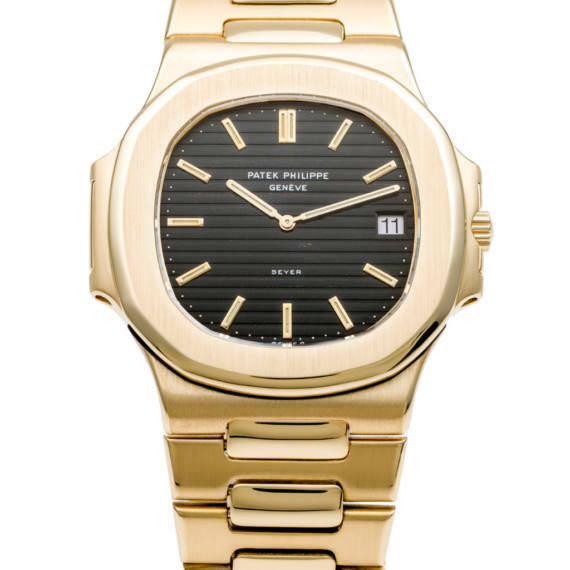 Patek Philippe's 2009-2010 Collection booklet describes the now discontinued reference 5016 as follows: “Its classic Calatrava case in yellow, rose or white gold or platinum unites the complications most highly prized by those with a passion for exceptional watches: the tourbillon, the minute repeater and the perpetual calendar – completed with a retrograde date hand and a moon phase display. 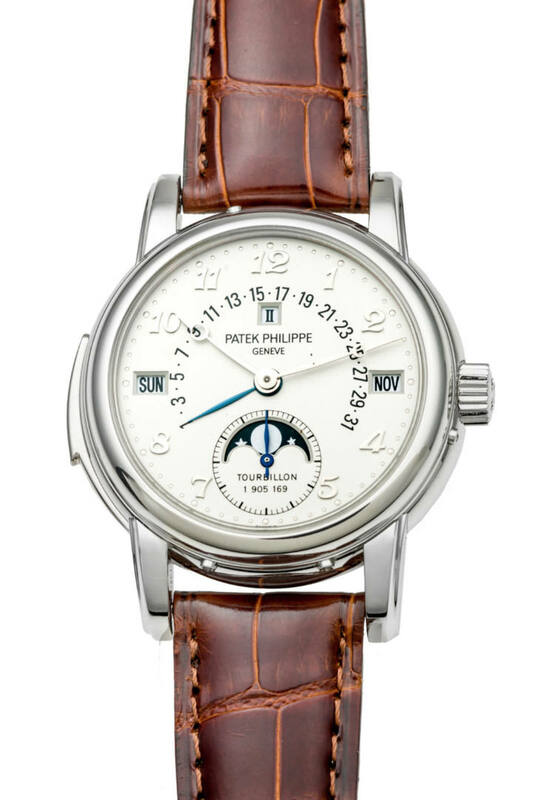 The movement making this masterpiece possible comprises 506 parts.” Offered for the first time at auction and complete with all its accessories and in unworn condition, an opportunity to acquire one of the most complicated masterpieces by Patek Philippe. 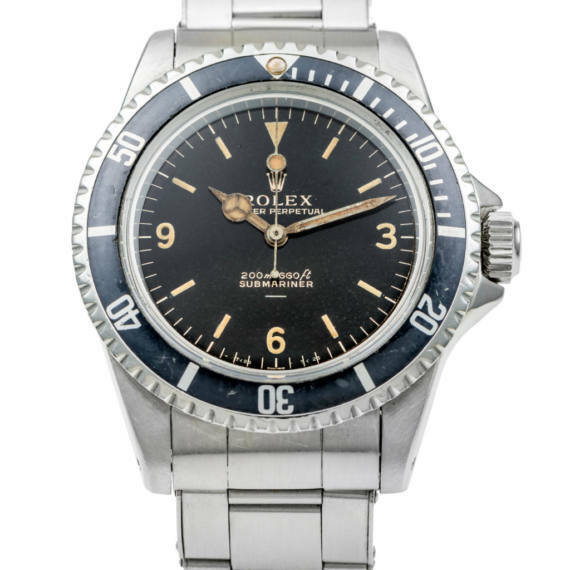 A fine and extremely rare, self-winding, stainless steel, diver's wristwatch with explorer dial. Property of the original British owner. Considered by many collectors as a true holy grail, the explorer dial Submariner has always held a special place in the collector's heart. Found also in the 5513 Submariner as well as in the 6538 and 6200, its distinctive dial layout is one of the most pleasing designs ever designed. Scholars seem to agree that many of these were delivered to the UK, such as this piece, maybe due to the diving/military connection. 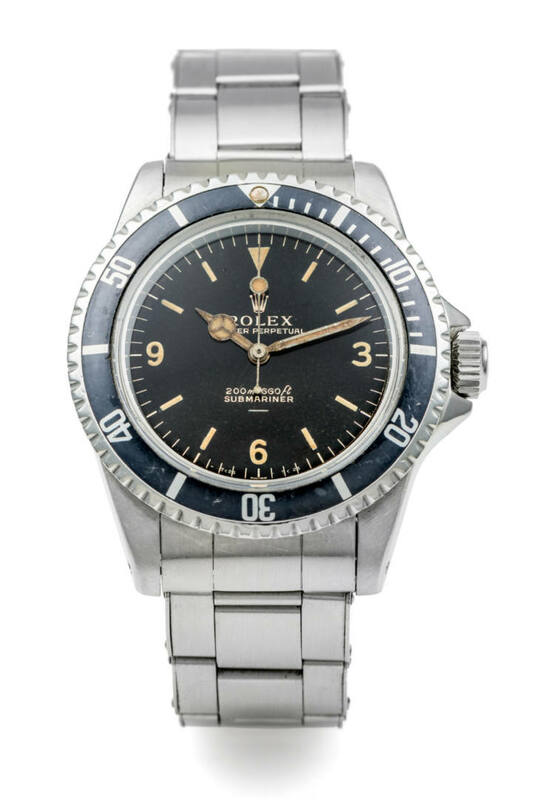 Featuring pointed crown guard and a low serial number dating to 1961, the 5512 Explorer Submariner is one of the rarest variants of the time. With a wonderful gilt dial featuring an underline that has been maintained in excellent condition, it is sure to please the most discerning vintage sport Rolex model collectors and has never appeared on the market until today. A fine and rare, large, self-winding, 18k yellow gold wristwatch with diamond dial.